You will be staying in a geust house at Wan. Accommodation on all other days will be in tents (2-3 per tent). Roopkund trek is in Uttarakhand. We all know that Roopkund trek is famous for its Skeleton Lake. The Lake is mysterious because more than five hundred skeletons of human are found at the edge of Skeleton Lake or Roopkund Lake. It’s one of the best sites to trekking in Garhwal. Roopkund does not attract people in India but Trekker from abroad visit Roopkund each year. The mystery of Roopkund remains a question for everyone. Some people believe that these skeletons are of heroes who had fought in the earlier times. Along with the human, horses and other animal Skeletons are also present there. In 1942 the skeletons were discovered the first time. It believes by the researcher that the death is caused by Landslide or Epidemic. Later in 2004, a team of Indian and European scientist visited the area to get more information. The researchers say that the skeleton belongs to 12th to 15th century. They examine and realize the addition of that 500 skeleton another equal number skeleton are perished due to natural conditions. The trek is moderately difficult and can be done by anyone having the appropriate endurance level. Beginners can also opt for the trek provided they have to prepare themselves physically and mentally simultaneously. One can attain a maximum altitude up to 16,499 feet subject to his endurance and other conditions such as climate, temperature and his experience level. The trek lasts for 7 days including the pickup and return. Picked up from the Dehradun the trekkers are taken back to the patarnachauni where they are driven back to the Dehradun. Everyday a trekker has to do trekking on an average of 5 hours subject to the weather conditions. Each season has its own particular excellence, and focal points. In India, summer treks are prominent for much valid reasons. A late spring excursion, rest from searing days alongside frigid snowcapped lake are strong to be a convincing recommendation. No big surprise that Roopkund trek is accepted the most prevalent summer trek in India. If you are not enthused about these but rather get a kick out of the chance to climb on a similar trail over lavish greener glades (Bugyal are for sure best in Aug/Sep), blooms in post monsoon is the correct decision for you. So, the trip of the snowclad Roopkund in summer is an unexpected one in comparison to the first skeletal lake as found in post rainstorm. Quite is no disadvantage in any season (accepting you have a strong trekking community) and you may pick according to your own taste. Temperature at Roopkund varies with time. In day it can range anywhere in between 13 to 18 degrees Celsius where at nights in could be as chilled as 0 to -8 degrees Celsius which is sufficient to give you an icy essence. The main attraction of this trek is the mystery behind the skeletons in the lake due to which it is also known as the ‘Skeleton Lake’. There has been many stories and theories behind this presence of the skeletons in the lake, but it was revealed that they are the remains of the people who faced a severe hail storm and died. If you are going for a trek for the first time, then this is the right choice for you. This trek is safe, adventurous, mysterious, and beautiful or we can say that it is a complete package. Obviously, everyone knows about the oak forests which are found above Wan, but do you know that these forests stretch for more than 3,000 feet. You can see Mount Trishul, which is the first 7,000 metre summit climbed by man, closest in front of you. Such a sight is unique in Himalayan Trails. You will experience many such things which will compel you to return to Roopkund for another breathtaking experience of the trek. Reach Dehradun/Rishikesh/Haridwar/Kathgodam early in the morning at Sharp 6 AM. Take a cab from here to Wan. Trekveda can arrange a cab for you, but you have to bear the cost of a cab. The actual trek begins today. After grabbing the bites in the morning, the trek begins at the ground level which gradually ascends on the road which leads to the Wan village. Trekkers at Gairoli Patal looking forward to Bedni Bugyal. The trek of the day end with a hot lunch at around 3 pm covering a distance of about 10 km. 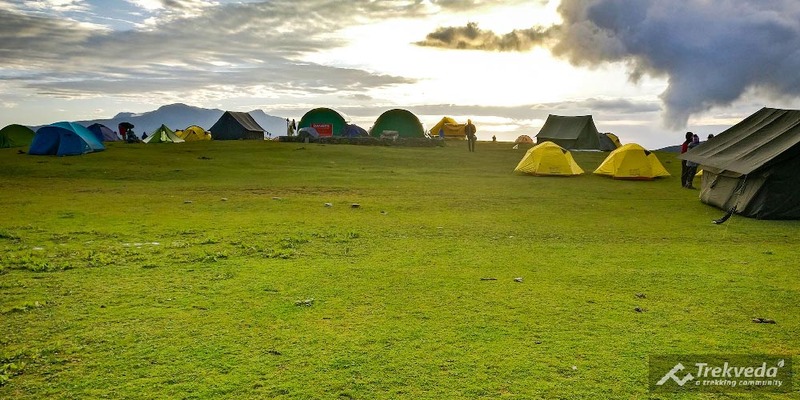 On the third day of your trek, we will approach the scenic beauty of Ali Bugyal, which is located at an altitude of about 11,000 ft. Ali Bugyal is considered as one of the highest inhabited locations of the country. A mesmerizing view of Bedani Bugyal. You will trek Towards Bedni Bugyal via Ali Bugyal. You will reach Bedni Bugyal before lunch, the outdoor spot for day 3. After lunch visit sanctuary in Bedni kund. After trekking for 10 Km you will reach Patar Nachauni, Take a good nap here as the next day is one of that mighty day of your trek. The cloudy view of Patar Nachauni will left you spell-bound. Wake up ahead of Schedule and prepare yourself for the longest day of trekking. Have filling breakfast to get the required energy. You will reach at a height of 14,000 ft. and the environment will not look unpleasant after you reach Bhagwabasa. After reaching Roopkund you will realize that it is without a doubt the most noteworthy point on the trek at a height of 16,499 ft. The summit day at mysistic Roopkund Lake. This is most probably the most unusual day of your trek where you have to return to the point from where you had begun this trek. Wake up early hour toward the beginning of the day; have some tea and breakfast. Today you will return from Wan to Dehradun. You can take a cab from wan and bear the cost of a cab with the fellow trekkers. Roopkund trek is one of the most magnificent place in the Uttarakhand. 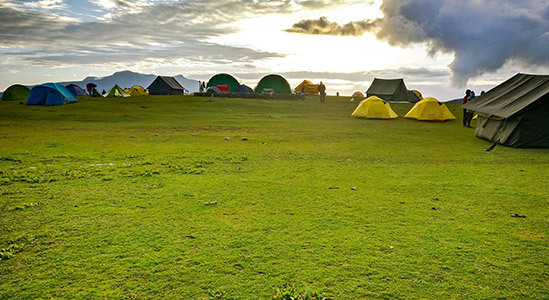 Considered as the heaven for trekkers, Roopkund gives an amazing experience to the trekkers with its lush green forests and snow-clad mountains. Popular for its mystery lake, the trek gives you a memorable experience for lifetime during your excursion. The high altitude meadows of Bedni Bugyal welcomes you with their rich in floral dynasty that not just soothes your eyes but also gives an immense pleasure to your soul. Located at an altitude of 4800 meters in the lap of the majestic Himalayan ranges, this is one of the most sought after place for trekking in the Garhwal region. Trekking is sort of soft-adventure sport which can be done by anyone with reasonable physical conditions. Trekking is exploring the Himalayas, which is enriched with the beauty of nature and a lot of adventures. Walking through the random forests and landscapes and finding the mysteries of places gives you a lifetime unforgettable experience. India is considered to be the most famous places if it comes to trekking for trekkers due to Himalayas, high mountains, valleys, forests, rivers and many such beautiful views. Trekking in India is very famous and people around the world visit India for trekking in places such as the Himalayas and Uttarakhand. You get an incredible and adventurous experience of trekking in India which you never forget in your life! The skeletons around the mysterious Roopkund lake is the major focal of attraction of the trek. The skeletons found on this trek is believed to be heroes of the ancient times who fought here a battle. In addition to the human skeleton, there are skeletons of animals like horses etc. which, reportedly are of 12th or 15th century A.D. , Albeit, the specialists tell all the way a different story about these skeletons. They assumed it as massive loss of livestock due to natural calamity like landslide, blizzard or any similar event which led to the loss of lives in this reason. Though the exact number of skeleton is not known yet they are presumed to be 500 and an equal number of skeletons are believed to have perished due to natural environment. Further, the radiocarbon dating of these skeletons at the Radiocarbon Unit of the prestigious Oxford University and other parts of the world has determined these skeletons to be as old as 850 A.D. A number of scientists believe that the people must have died due to hailstorm and their skeletons could not perish due to the icy and cold weather of the area. The favorable conditions preserved the skeletons and prevent them to decay off and decompose into the soil. At the beginning of the trek, you’re welcomed by the lush green forests of oaks at Ghairoli Patal. Your trek begin with the melody of birds accompanying the rustling of the dry leaves which lasts for 3-4 hours as this is the time all it takes to climb to the campsite. Camping amidst of the old oak trees where setting sun behind the Mt. Trishul spreads its rays through the canopy creates a perfect blend of the nature. Ali Bugyal and Bedni Bugyal are two of the most lush and magnificent meadows that hold the might to steal your heart with their beauty. While approaching the trek, you feel like revitalizing the windows XP wallpaper as the mountains surrounding the meadows add the beauty in it. A magnificent glimpse of Mt. Trishul, Nanda Ghunti can be stolen with some other majesty peaks such as Neelkanth, Kedarnath, Chaukhamba ranges etc. A great dose of adventure is something one can’t deny. 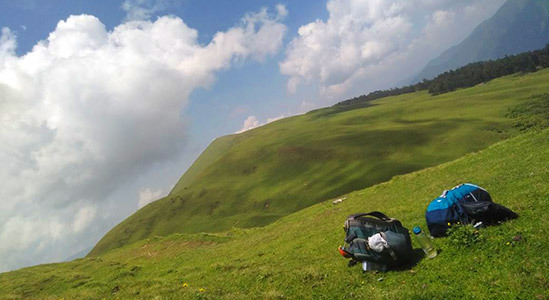 A balanced dose of thrill and adventure is what you get at the Roopkund trek. While trekking through the Junargali, you feel the highest adrenaline rush when you steep along the sharp, exposed ridge. Depending upon the number of factors such as weather conditions and the time of the day, the trek gives you a perfect blend of adventure and sight-seeing altogether. 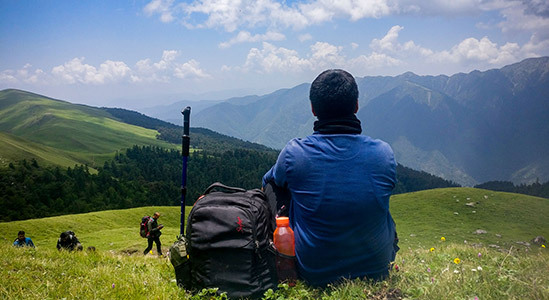 It takes around a week excursion to explore the entire Roopkund trek and each day will give you the experience that is worth more than just an ordinary day. Roopkund temperature gives you a feel of no less than a hill station. Summing up shortly, Roopkund is one of the most picture perfect place blessed with the ample of natural beauty, ranging from snow clad pristine mountains of Mt. Trishul to spell binding meadows of Ali and Bedni Bugyal. Mystery Lake of Roop is just an added charisma to the place that not only leave the trekkers puzzled about the skeletons but also give them a sense of thrill altogether. The religious importance of the place can be judged with the event that happens every year in autumn at the alpine meadows of Bedni Bugyal and one can also witness the majestic Nanda Rajjat Yatra amidst of the beautiful Himalayan abode. How sheltered is the Roopkund trek? The elevation pick up is a hazard segment in the Roopkund trek. As you go higher the accessibility of oxygen gets lower. With bring down levels of oxygen, dealing with the ascensions isn't simple. You truly need to climb gradually enabling your body to adjust to the lower oxygen levels. There are three areas that will push you hard. The first is on the very beginning of the trek. You set out from Wan town with a move to the highest point of the edge that hangs over the town. That is a hours climb effortlessly. At that point there's a beautiful plummet to the Neel Ganga waterway. From the stream it is an inside and out move of 3½ hours to Ghairoli Patal campground. Particularly for a first day's trek it leaves your heart pumping. The uplifting news is, it is a brilliant readiness for whatever is left of the days. Additionally the Ghairoli Patal campground makes it worth the climb. On the fourth day, there is a firm move from Patar Nachauni to Kaluvinayak. It is a switch back climb (crisscross) picking up height rapidly. It is over in two hours. In any case, at that height your legs and lungs will shout. On the fifth day, when you climb Roopkund from Bhagwabasa, it is another enormous climb. It takes around 3 hours to get to Roopkund, for the most part on snow. The energy of the day, however, makes everybody overlook the climb. There are direct trips in the middle of, particularly on day two and three, however not something that will extend you. 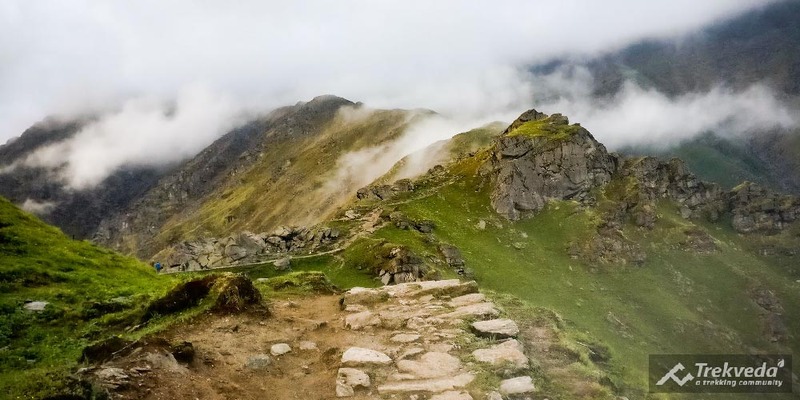 On the off chance that you have enlisted for this trek, at that point here is some data that you should know with a specific end goal to have a sheltered trek. At Trekveda, we trust that as long as you are very much educated and all around set you up, can survive effortlessly at high elevations. Over long periods of sorting out high elevation treks, we have discovered that security issues flourish among the individuals who are unfit and caught off guard for the trek. So we have presented a qualification criteria for the Roopkund trek. Any individual who needs to enroll for the Roopkund trek needs to meet the wellness necessities, with the perfect BMI. The BMI and wellness administration will require confirmation. A high height trek isn't to be taken coolly. Frequently disregarded, rest is an extremely basic to abstain from getting hit by elevation ailment. Bedni Bugyal at 11,700 ft is the ideal place to give your body a chance to change in accordance with the thin air. As you investigate the immense knolls of Ali and Bedni your body prepares for the higher elevations of Bagwabasa and Roopkund. Roopkund is a moderate grade trek which can be done by the beginners as well provided they have had their physical and mental work done before at least 2 months. 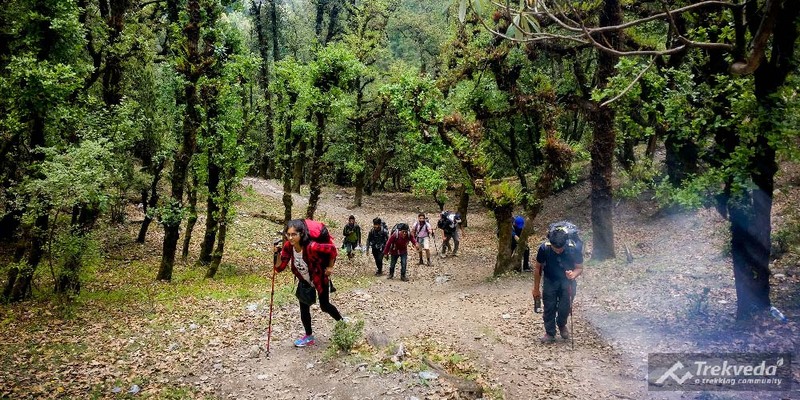 Despite of being a moderate trek, there are certain things that are needed to be taken under the consideration before you head to the Roopkund trek. Heading to the Roopkund without prior preparation is something you’re fooling yourself or putting your life under threat. Merely a walking practice for a fortnight or more will never do the magic instead can put your life at risk. The strength of your legs is something you need to work upon. Here is what you can do to strengthen your leg muscles to bear the pain of Roopkund trek. The trek expense of Rs. 8,300 + 5% GST takes care of all expenses of the trek from Wan to Wan. Accommodation – Stay is incorporated from Day 1 to Day 8 (Wan to Wan). You will remain in a hotel at Wan and outdoors on the various long stretches of the trek (3 for each tent). Meals – All suppers from supper at Wan on Day 1 to breakfast on Day 8 are incorporated. We give straightforward, nutritious veggie lover sustenance on all long periods of the trek. Camping Charges – All trekking licenses and backwoods outdoors charges are incorporated. 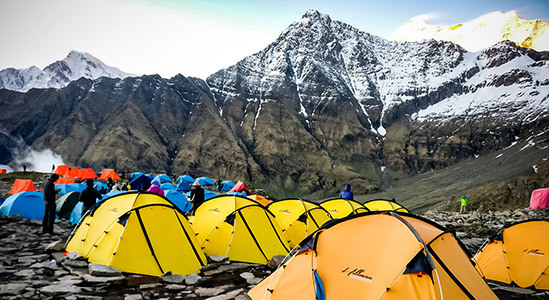 Trekking Gears – You will remain in superb tents and resting sacks in every one of the camps. Our high height dozing packs can withstand temperatures as low as - 10 ºC. We give ice tomahawks, restricted, smaller scale spikes, gaiters and so forth as required. Safety Equipment – First guide, therapeutic unit, oxygen chambers, stretchers and so forth will be accessible at all campgrounds to manage crises. Services of a specialist Trek Leader – All our trek leaders are qualified in fundamental/propelled mountaineering courses. Services of a specialist Trek Team – The mountain staff on this trek comprises of very much prepared aides, cooks, aides and doormen. Transport to and from the base camp – Trekveda will offer the taxi services from and to the base camp. We will mastermind shared cabs for trekkers to lift you up from Dehradun/Rishikesh/Haridwar/Kathgodam and drop you again from Wan. This will cost approx. Rs. 5,500 for each 5-6 seater vehicle every way. You should impart this cost to alternate trekkers. Food amid travel to and from the base camp – The trek expense does exclude dinners bought amid the excursion to and come back from Wan. Backpack offloading charges - If you wish to offload your rucksack, there will be an extra charge of Rs. 1,850 + 5% GST. The knapsack can't measure in excess of 9 kg. Bags/strolleys/duffel sacks won't be permitted. It would be ideal if you take note of that charges will differ for a minute ago offloading on the off chance that you choose to offload your sack in the wake of achieving Wan (Rs. 350 every day comprehensive of assessments). Online offloading ahead of time is conceivable up to two days preceding the trek begin date. Stay at Dehradun/Rishikesh/Haridwar/Kathgodam on the most recent day. Personal costs of any sort. Buffer day – It is mandatory to have this extra day as any bad weather or rain will delay your pass crossing. If buffer day is utilized, you will need to pay Rs. 1,800 + 5% GST. This amount is to be handed over to your trek leader. 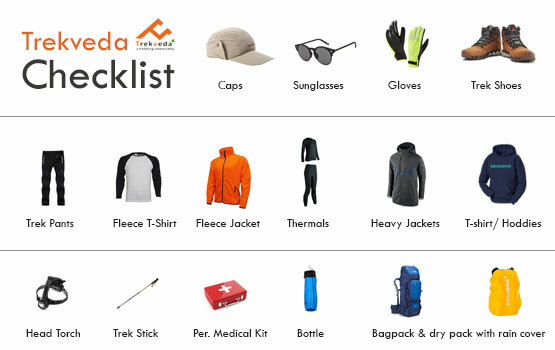 Cancellation: If a trek is canceled ultimately because of a characteristic catastrophe/unforseen conditions (like downpours, tremor, avalanches, strike, bandh and so forth), Trekveda will issue a trek voucher for everything. The voucher can be reclaimed for a similar trek or another trek in the following multi year. In the event that, you wish to drop your trek, if it's not too much trouble mail us to drop. It would be ideal if you note: in the event of discount, there will be a derivation of 4% (bank charges) from the aggregate expense you have paid. Likewise, on the off chance that you have selected a trek protection, the sum won't be discounted. The trek charge incorporates all bunks of the trek from the begin at Wan to the end at Wan. Get: Trekkers are grabbed from Kathgodam Railway Station at 6.30 am. For the most part, trekkers are clubbed together with different members to make a gathering. The gathering heads out together to Wan in shared taxis. Transport: Transport from Kathgodam to Wan and back can be masterminded by us at an additional cost. Members are relied upon to share the cost of the taxi (rough cost of the taxi: Rs. 5,500 one route for a 5-6 seater vehicle. The sum is to be paid straightforwardly to our transporter. Knapsack conveying: Trekveda anticipates that all trekkers will convey their own particular rucksacks. All normal apparatus will be conveyed by the help group. On the off chance that for reasons unknown a trekker can't convey his or her rucksack, he/she can offload the same by paying an extra charge. Rucksack offloading charge for the whole trek length is Rs. 1,750 or more GST of 5%. Fractional offloading isn't permitted. Charges will fluctuate for a minute ago on incline offloading Rs.350 every day comprehensive of expense. The knapsack can't measure in excess of 9 kg. No bags/strolleys/duffel sacks will be permitted. Online offloading ahead of time is conceivable up to two days preceding the trek begin date. Crisis amid trek: In a trek a therapeutic crisis or some other crisis may emerge. On the off chance that for any reason you are sent down from the trek then Trekveda will influence game plans for your arrival to the base camp or closest street to head. A staff will go with you. He may not be a prepared staff. Enrolling for this trek is an understanding that you have perused up on the challenges of high height trekking and comprehend the dangers. You have additionally comprehended what AMS, HAPE and HACE are. You have taken endeavors to teach yourself and you are in a situation to deal with your own elevation related crisis. Wellness: A high height trek in the Himalayas requires significant wellness. Your body needs to prepare itself to process more work with bring down levels of oxygen. Cardiovascular preparing before a trek is fundamentally imperative. Preparing must incorporate quality and adaptability exercise. We have spread out the qualification criteria here. Enlisting for the trek is an understanding that you will embrace the commanded wellness preparing. Trekveda has the privilege to dismiss hopefuls who don't meet our qualification necessity at the base camp. Non-obligation: Trekveda isn't in charge of any misfortune/harm of your apparatuses/gear or different things on the trek. Payment: Payment for the trek should be possible online through credit/platinum/debit card or net managing an account. Check/draft or money isn't acknowledged. Drinking and smoking amid the trek is entirely restricted. On the off chance that discovered mocking the principles, your support on the trek will be dropped with quick impact. Course changes, deferment, deferral or completing the trek a day earlier: Under some uncommon condition, your trek may end multi day sooner or begin multi day later. This may end up vital because of harsh climate, snow and ice conditions, political limitations or some other reason. In case of a change, deferment or deferral, members have no privilege to discount of the trek (in entire or to some degree) or other pay for any damage, misfortune or harm. Trek expense isn't run after broken as far as days however a composite charge for the entire trek is. While our schedules are intended to take into account satisfactory acclimatization, most treks in Indian Himalayas climb rapidly, which is called constrained accents. Inaccessibility of campgrounds and the Indian Himalayan territory are the purpose behind this. There are chances that you will feel the impacts of height ailment and oxygen hardship while on this trek. If it's not too much trouble know that your trek pioneer may esteem it risky for you to keep trekking whenever, and mastermind you to slide to a lower demeanor. Our trek leaders will lead routine wellbeing checks at all camps to quantify oxygen immersion, heartbeat and circulatory strain. Trekveda maintains whatever authority is needed to bar any trekker from moving higher on the trek without discount if the trekker's imperative readings are underneath acknowledged standards for that elevation. These standards are accessible with Trekveda trek leaders. What is the average Roopkund temperature is? One of the best thing about the Roopkund Trek is the Roopkund temperature it is usually cold here throughout the year but during the second season you will get a range of temperature of 13 to 18 degree Celsius in day while it is considerably cold at night with an average temperature ranging from 0 to -7 degree Celsius. Hence in order to get yourself not bothered with the temperature all you need is to keep yourself tuned up with the changing temperate hours. However our trek leaders are the trained professionals who would let you know about the precautions. What is the mystery of Roopkund Lake? 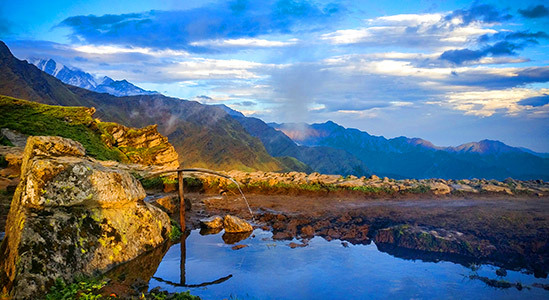 The mysterious Roopkund Lake is what compel the trekkers to visit the trekkers at large. However the skulls and skeletons of more than 500 human and animals around the lake is what makes the people more inquisitive about the trek and according to the myths they’re the remains of the heroes who fought a dreadful war, however scientists and researchers have another facet of the story that these bony skeletons may be formed due to a natural hazard which took the lives of so many people and livestock at once and at one place which may be a blizzard or a landslide. What is the height of Roopkund? The Roopkund height is what varies with every phase you pass as your approach the Roopkund, you virtually acclaim a height of around 15,750 ft. while if your still willing to measure the skies then you may climb up to Junargali which is at a height of 16000 ft.
What will be the basecamp? Trekveda makes its basecamp at Wan village. This is one of the most beautiful village that leads to you to the pristine snow-clad areas while letting your relish the vibrancy of the nature at large. 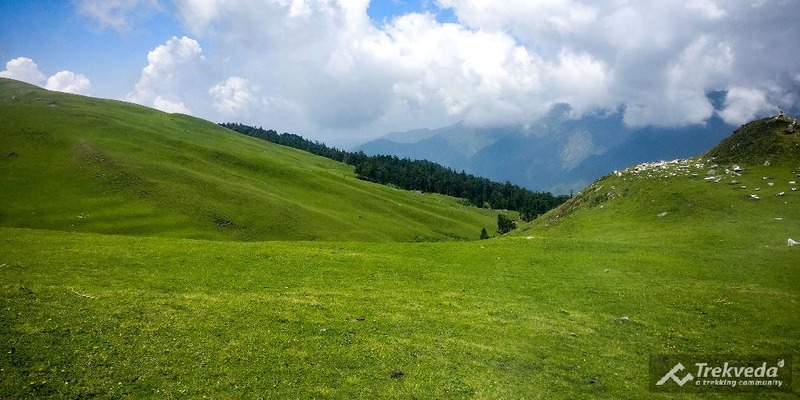 Wan village leads you to the majestic heights of Roopkund via beautiful mesmerizing Bugyal of Ali and Bedni which will give you an ecstatic experience of walking on the wallpapers you have seen virtually. How do we reach to Wan? Our basecamp would be at Wan where you can reach via number of ways. There are number of means of transport, in case you want to share a taxi then it would cost you 5500 which can be equally shared among all the passengers while if you’re planning on budget you may approach a bus which would merely cost you 300-400 bucks per passenger. However planning a trip as per the comfort would make your trek easier and you’d not be exhausted before the real thrill. Your accommodation at Roopkund trek in the beginning and the end at the guest houses where you’d be sharing the rooms with the fellow passengers. The stay on the other days will be at the tents which will be provided by the Trekveda. Each tent will be shared by three fellow trekkers however special arrangements can be made on request. A separate tent will be assigned as the toilet room at each campsite. Any additional baggage (without valuables) can be left behind at the Wan village. 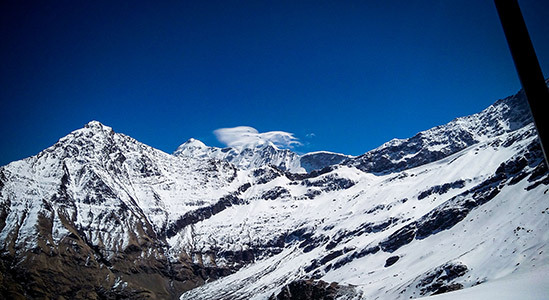 The best season to see the snow on Roopkund trek is the first season i.e., May-June where you can see a lot of snow clad places while the October also witness the fresh snowfall at heights if the climate is favorable but if you’re planning to see the snow at large then the season of May-June should be your preference. Is there mobile network on this trek? Availability of mobile network on this trek will vary from place to place as there are certain places where, there is no network coverage. However, at some places you would be able to reach to your near and dear ones as there are towers for mobile network coverage. Day 1 – You need to travel at least of 10 hours to reach to Wan from either of the station i.e., Kathgodam or Dehradun. Day 8 – Trek back to Wan for about 5.5 hours and drive to your respective station. 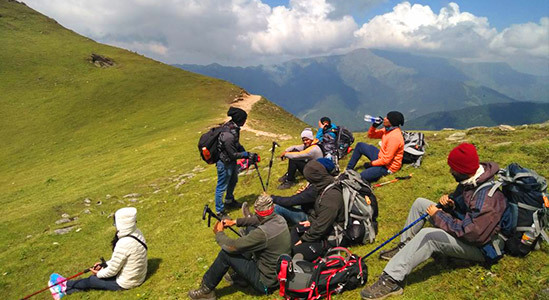 Roopkund trek is considered as the trek with moderate difficulty which can be done by the naïve or beginners with some basic physical fitness or preparation prior to trek. Roopkund trek serves you with its grand lush greenery at Bugyal while making you feel like a chilling box near the Roopkund Lake which is capped with ice altogether. The sloppy ice treks make it difficult to walk. You can’t risk taking the preparation for physical strength prior to trek for granted as it may cost you losing your best trek experience. The specialized trekking shoes would do it all for you. The trekking shoes give you the needful grip while climbing or crossing the water streams. However on the snow, we would provide you with detachable spikes which will help you to stiffen your grip on the icy slopes during the trek. You need to return these micro spikes attached to your shoes to the trek leaders at the end of the trek at the basecamp or prior to that. 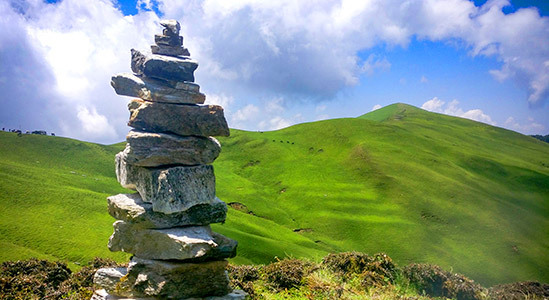 Yes, of course, we have an acclimatization day on this trek and that would be at Bedni Bugyal where you will be calibrating your bodies by spending time in the nearby locations such as local markets or woods in the vicinity. This will help you to pace up with the climate at the high altitude and thus protect you from any fatal consequences during the take that might happen due to the climate change. A better adaptive body will have the most amazing experience at the trek. Yes of course, the age limit to this trek is 10 years but ensure all his physical and medical competencies before the trek. In case of any prior medical condition, let us know about the child so that our team of professionals can do the needful measures to ensure the safety of the child. In addition to that, prepare your child physically fit for the trek as everyone needs to cover the equal distance during the trek. A child above the age of 10 and a young (with the zeal) up to the age of 60 can go for the trek. However certain implications are considered by our professionals before accepting the trekkers of age above 50 such as their physical strength and stamina coupled up with any medical condition that may become fatal during the course of trek. Yes, of course but with the proper preparation. Considering the difficulty of the trek and the phases you will have to encounter gives you an exact idea of the distance you need to cover up daily. Being the first timer, all you need to prepare is to keep yourself physically and mentally fit. Which are the best seasons for the Roopkund trek? There two most promising seasons for this trek i.e. May-June and September-October. 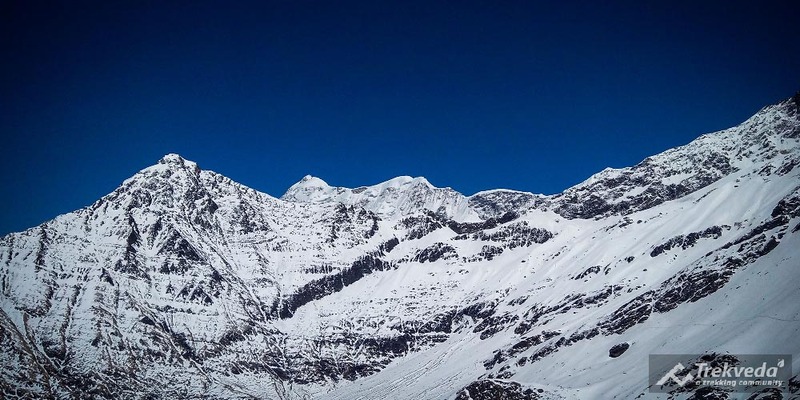 If you are willing to visit a snow capped Roopkund, you must opt for the first season that is May-June and especially if you’re residing in the planes it would also relieve you from the scorching sun of your place. However in the second season, October also receives the initial snow fall in the trek. Returning to the home with the mystical memories would probably be the best feeling after the trek. To return, Trekveda will arrange shared cabs/taxis for which the expenses will be charged by the trekkers and is not included in the trek fees. What will be the total expense for a Roopkund trek? The total expenses exclusive of the things not mentioned in the trek will be 8300 per person. In addition to that an additional of 5% of the GST will be levied on the total cost.